A practical lamp that gives beautifully diffused light where ever you need. It's hook and extendible cord mean that it can be used almost anywhere. 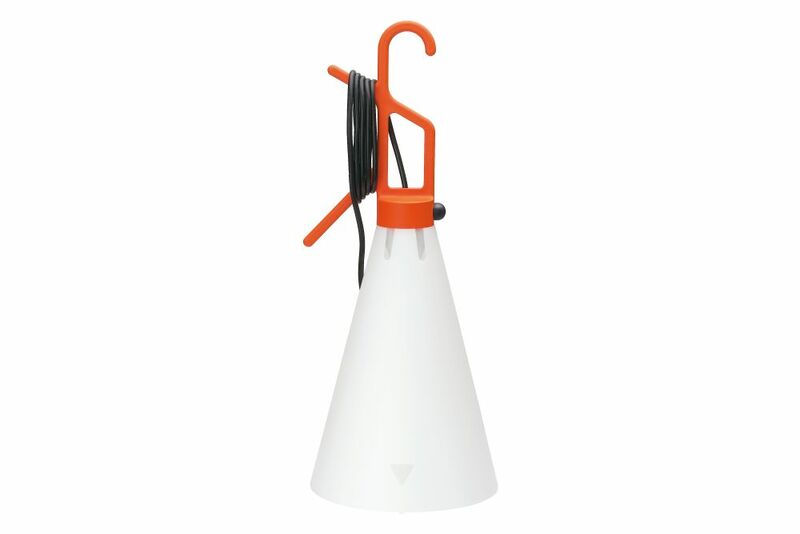 May Day is a lamp suitable for multiple uses and locations: it can be positioned on a table, placed on the floor, or suspended, thanks to the practical handle, which also acts as a cord reel. Utility light fixture. Injection-molded tapered opaline polypropylene diffuser. Hook/handle, also acting as cord winder, made of 10% talc-filled injection-molded polypropylene. Push button switch on handle. Konstantin Grcic was born in 1965. He was trained as a cabinet maker at The John Makepeace School (Dorset, England) before studying Design at the Royal College of Art in London. Since setting up his own practice Konstantin Grcic Industrial Design (KGID) in Munich in 1991, he has developed furniture, products and lighting for some of the leading companies in the design field. Amongst his renowned clients are Authentics, BD Ediciones, ClassiCon, Flos, Magis, Maharam, Muji, Nespresso, Plank, Serafino Zani, Thomas-Rosenthal and Vitra. Many of his products have received international design awards such as the prestigious Compasso d`Oro for his MAYDAY lamp (Flos) in 2001 and the MYTO chair (Plank) in 2011. Work by Konstantin Grcic forms part of the permanent collections of the world´s most important design museums (a.o. MoMA/New York, Centre Pompidou/Paris).